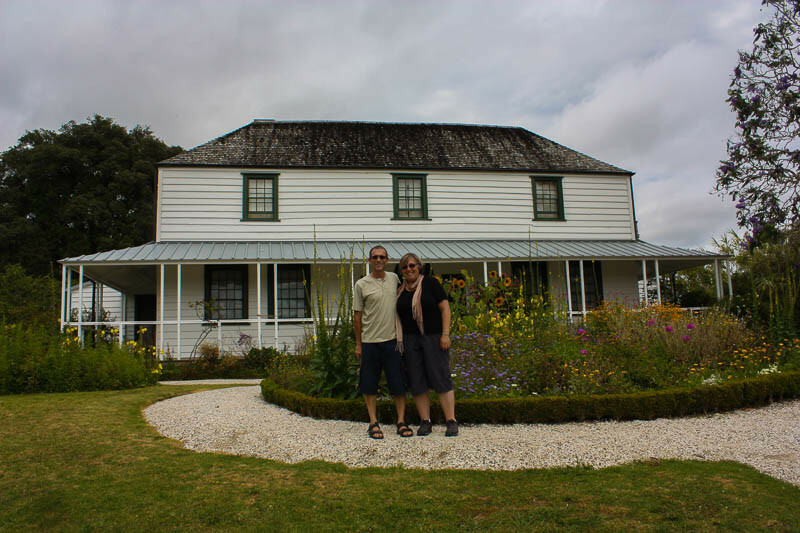 Established in 1819, the Kerikeri Mission Station is home to two of New Zealand’s oldest buildings and offers an interesting bit of the country’s history. It was built 22 years before the Treaty of Waitangi established the relationship between Britain and the indigenous Māori people. Europeans were arriving in increasing numbers, and there was tribal fighting in various areas. The Kerikeri Mission Station was one of the first places in New Zealand that the Māori invited European settlers to live amongst them. More importantly, it was a European settlement built under the protection of local Māori chiefs. Built by both Māori and missionary carpenters, Kemp House is New Zealand’s oldest surviving European building. The nearby Stone Store is the country’s oldest surviving stone building. 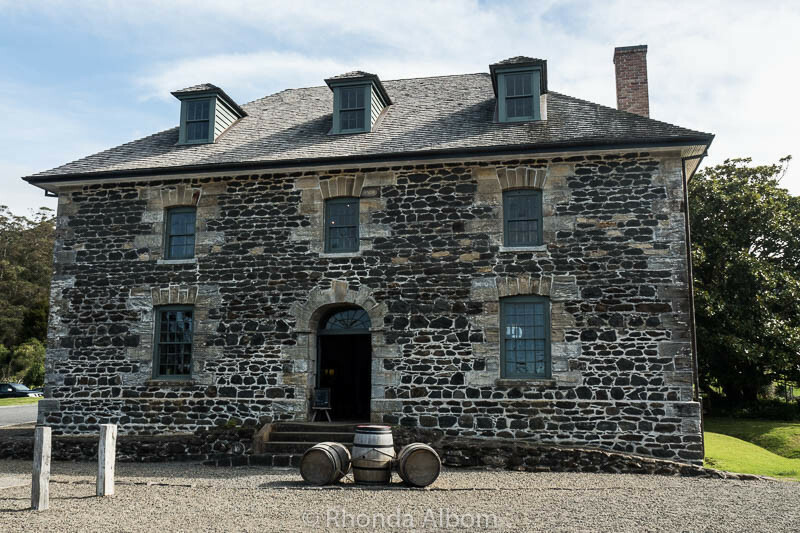 Originally built as a storage depot, it has been operating as a general store since the 1870s. Today it is a fun place to look around for an eclectic mix of modern and old. Located in the Bay of Islands, the grounds are a picture perfect spot worth a visit even if you don’t take a tour. The three primary buildings of the Kerikeri Mission Station: Kemp House, Stone Store, and St. James Church, are listed on the New Zealand Historic Places Trust. 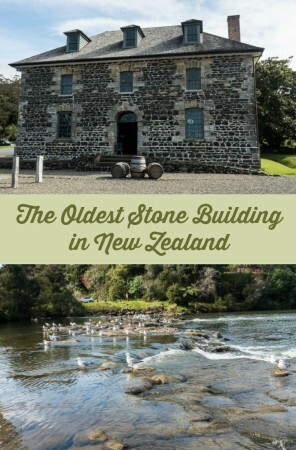 Built in 1832 -1836, the Stone Store in Kerikeri is New Zealand’s oldest surviving stone building. An AFS exchange student shopping in the Stone Store. 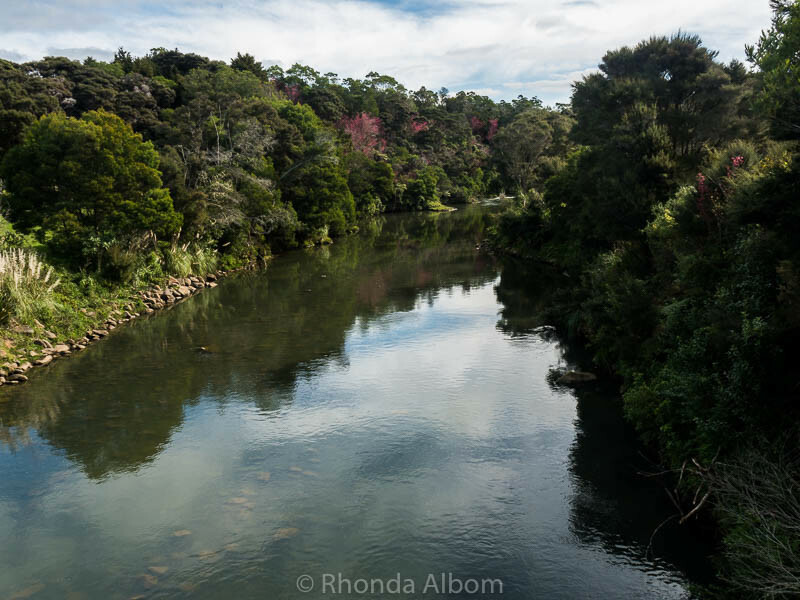 View of the Kerikeri River from the footbridge leading to the Stone Store from the Kerikeri Lookout car park. Will you make a wish in the nearby wishing well? We just came to relax and enjoy the grounds. Kemp House is the oldest surviving European building in New Zealand. Built as a mission house in 1821-1822 it was occupied by descendants of the Kemp family until 1974 when it was gifted to New Zealand. We last toured it three years ago. Inside the Kemp House kitchen. 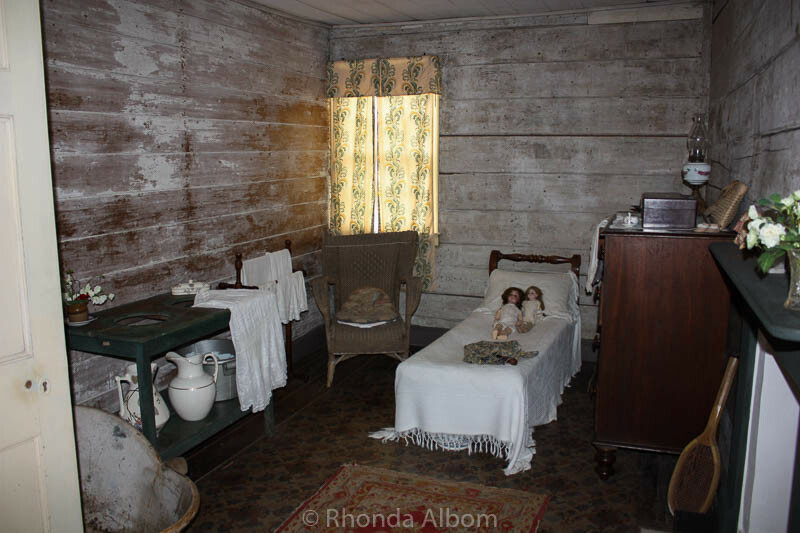 Inside a bedroom in the Kemp House. St James’ Anglican Church is visible when looking up the hill from the Stone Store. It was built in 1878 and is still in use today. The Stone Store and Kemp House are open daily at 10 am closing in summer at 5 pm and closing at 4 pm the rest of the year. Check their official website for more details. Entrance to the Stone Store shop is free. 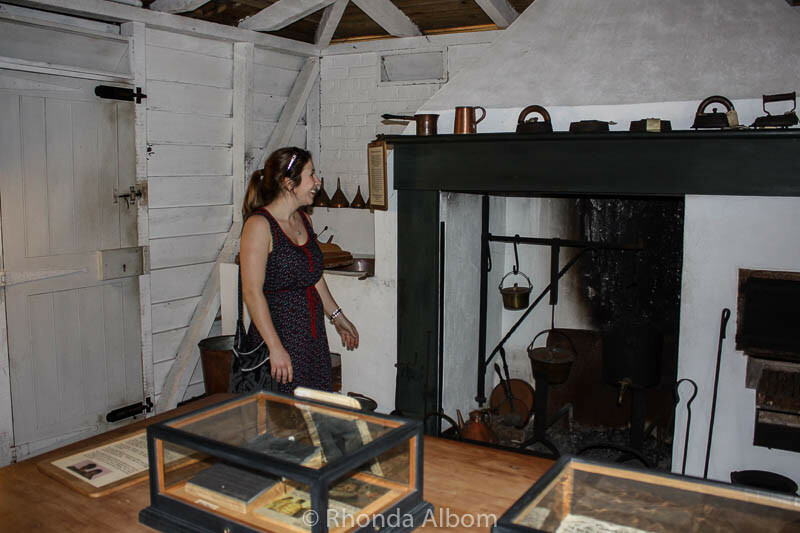 Guided tours are the only option for entry inside the Kemp House and Stone Store Museum. Neither the Kemp House nor Stone Store Museum is wheelchair accessible. Kerikeri Mission Station is a 30-minute drive north of the Waitangi Treaty Grounds. I recommend it as a stop if travelling to the Bay of Islands, or as part of a longer itinerary to the top of the North Island. Don’t miss two nearby waterfalls: Rainbow Falls while in Kerikeri or Haruru Falls near the treaty grounds. 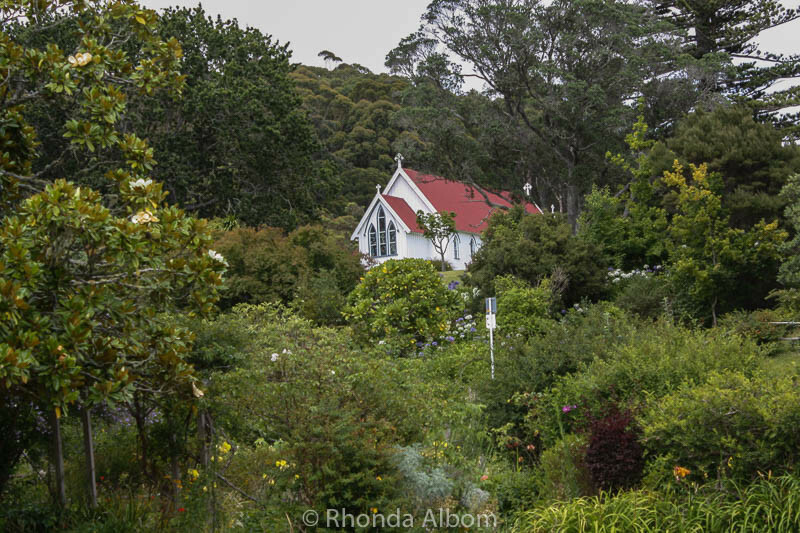 Have you been to the Kerikeri Mission Station? You always find new and interesting places like Kerikeri Mission Station. Keep them coming. 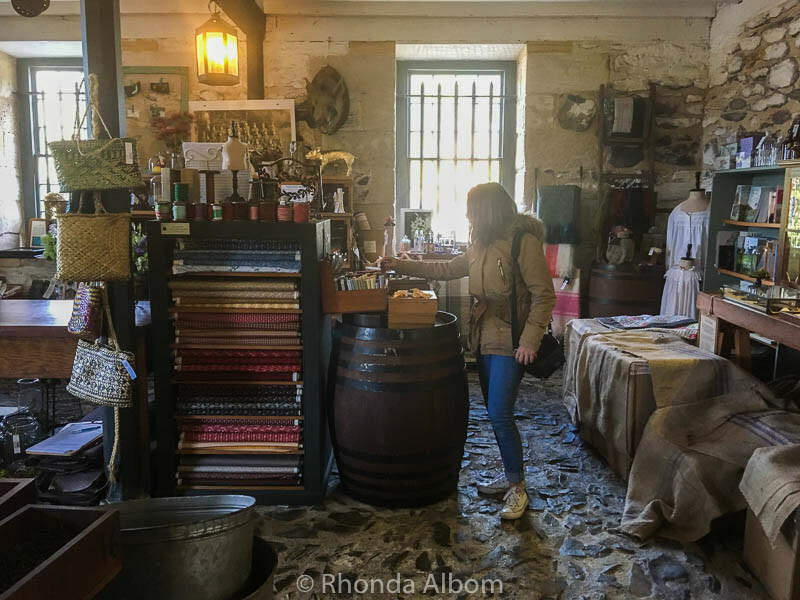 We love exporting New Zealand, so many interesting places to find. Your photos are doing an especially good job of making me want to visit Kerikeri Mission Station. It looks like a relaxing place to wander around and just look at things. I wonder if the people who built these structures imagined that they would still be standing and visited a few centuries later. Being new to the place, they were probably hoping to survive at least a few years. Actually, it’s not a few centuries, is only a bit less than one. New Zealand is a very young nation. Looks like a beautiful and serene place to be! 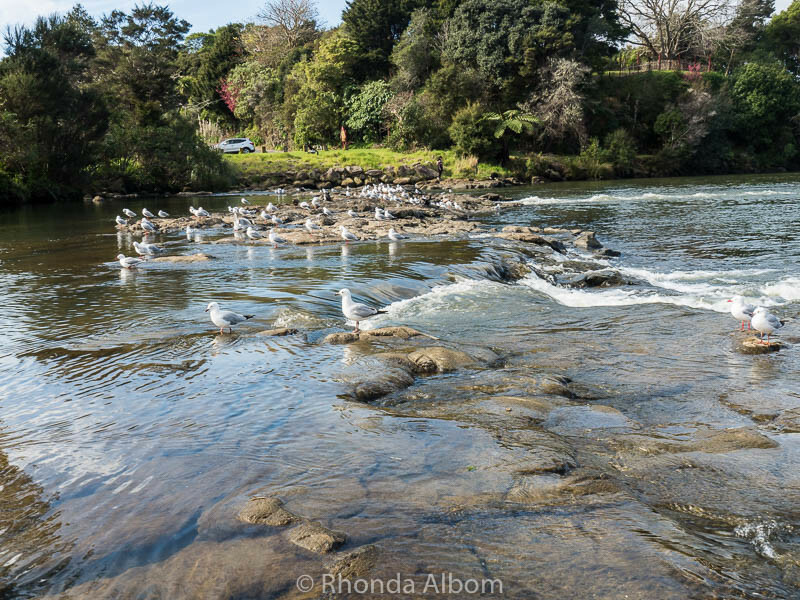 The Keri Keri River looks like a peaceful setting and I could sit by the water all day. What a lovely lovely place to visit! Both inside & outside the house looks so gorgeous! I love the grounds. I could sit there for hours and relax. We may be a young nation, but we still have a history. Kerikeri Mission Station looks like an interesting place to visit. I also find it interesting that Kemp House was built jointly by Māori and missionary carpenters. I really enjoy historical places like this. It is interesting, and peaceful. I agree, somehow I had missed that piece of information on our last visit. What beautiful old buildings Rhonda. I love visiting historic places, you can almost feel the presence of those who’ve lived there. And this one still has so much of the original things, even the store still sells things from days past. I still have a few more left from our last trip. fascinating- we really need to get over to New Zealand! I love exploring old dwellings. They have so much personality. And my best friend’s name is Kerri – she’ll get a kick out of the name. 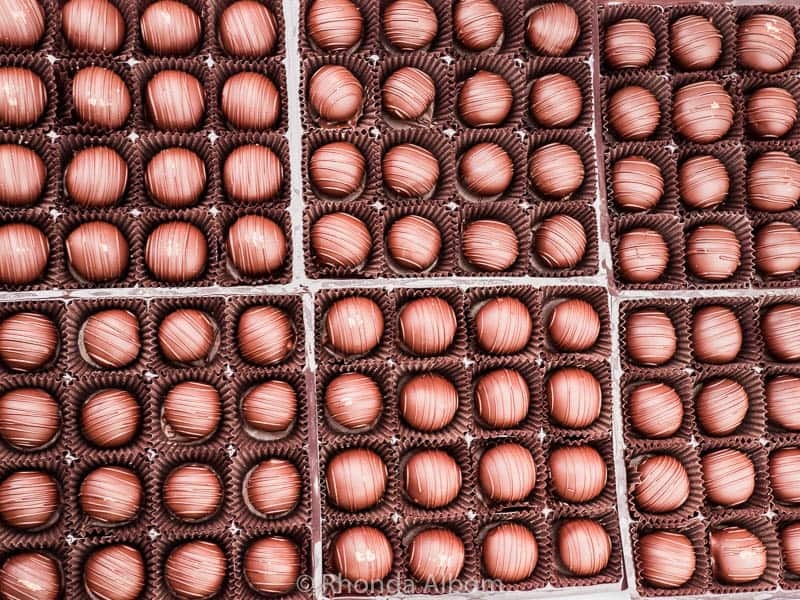 LOL – Kerikeri has only one r in each Keri, but she will probably love it anyway. Very interesting, Rhonda. I found out something new about the relationships between the Europeans and the Maori. As for ‘old’ in the Southern Hemisphere, it seems more like ‘new’ in Europe or other parts of the world. Interestingly, I found out several new things about the relationships, past and current, on this trip up north with the AFS girls. LOL – I hope you wish comes true my friends. No, I’ve not been there but I’d love to visit. What a fun place to explore. It is so beautiful here. I just love to sit and relax. wow, i thought America was a young country compared to Europe, where a 500 year old bridge is the “new” bridge. But NZ is very young, isn’t it (relatively speaking)? I love local excursions like these. The buildings and settings seem wonderful! That is exactly what I usually think when we visit New Zealand historical sites. The Europeans have only been here less than 200 years, and the Maori came only 1000 years ago. The Stone Store is really cool. And still functions as a store, which is impressive. And it still has many of the old items in the store, in addition to modern ones. 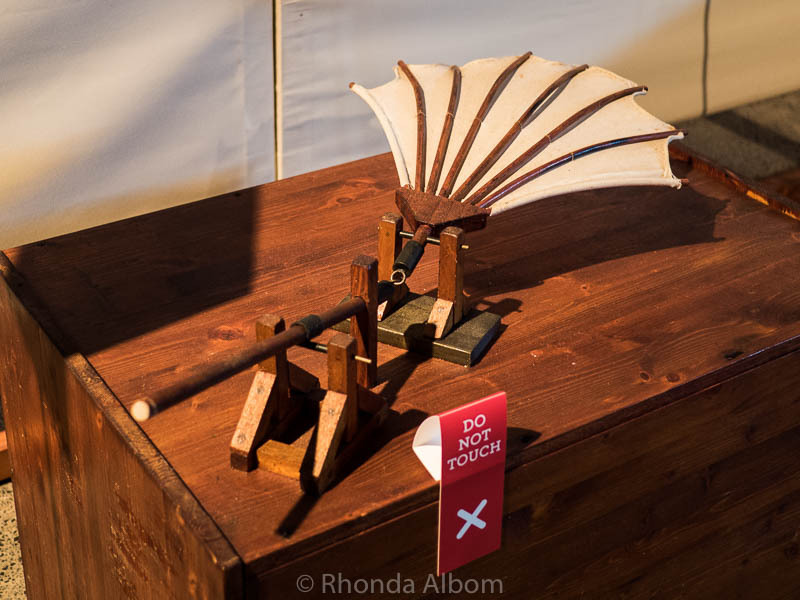 Plus lots of quirky Kiwi things. I’m always amazed at how truly young the oldest buildings in New Zealand and Australia are. Nevertheless, these are an important part of history. Greetings from an historic baroque town in Brazil (also a ‘young country’ – just not such a ‘baby’). Being an expat here, I know what you mean. 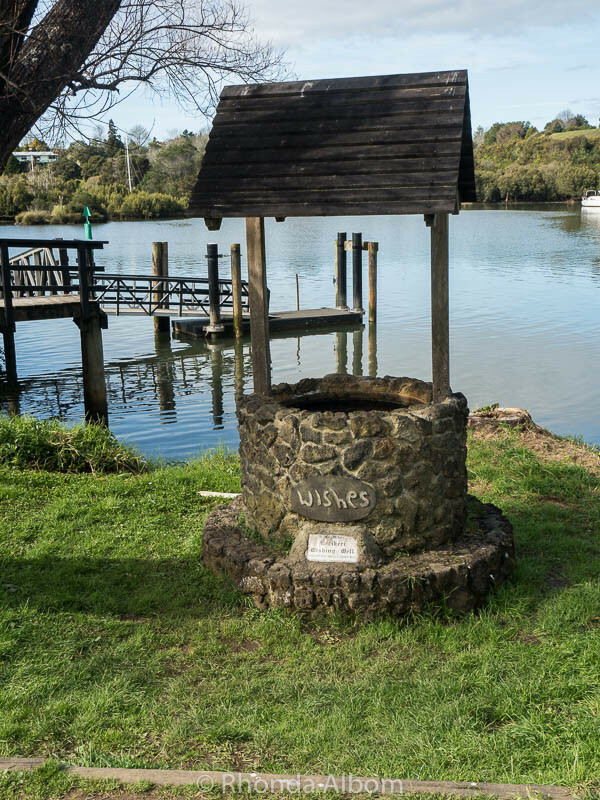 It looks lovely – do people drop coins into the wishing well and did you make a wish? To be honest, I never saw the wishing well before this visit, and I didn’t have any coins. We enjoy stopping here even without a tour. What a lovely old stone home. 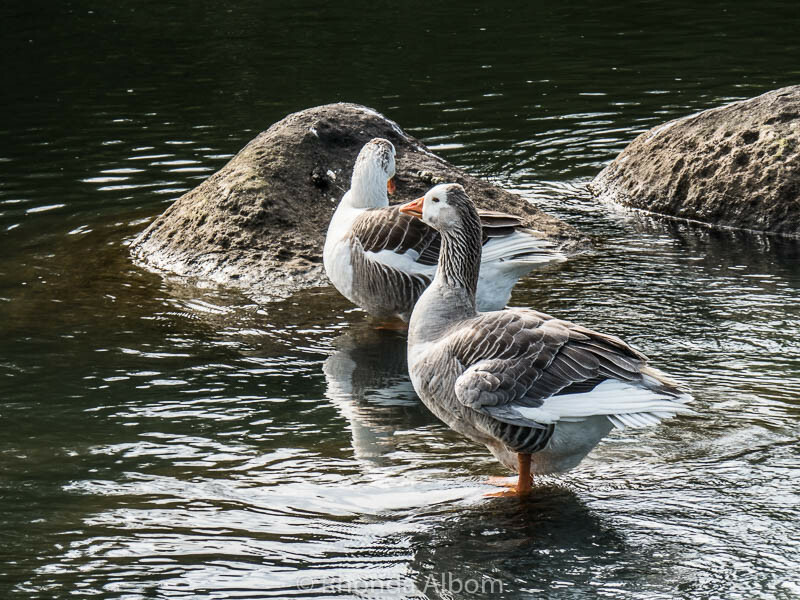 I love the view, the geese and especially the wishing well! Thanks for sharing! We are no where near the earthquake area. Thanks.